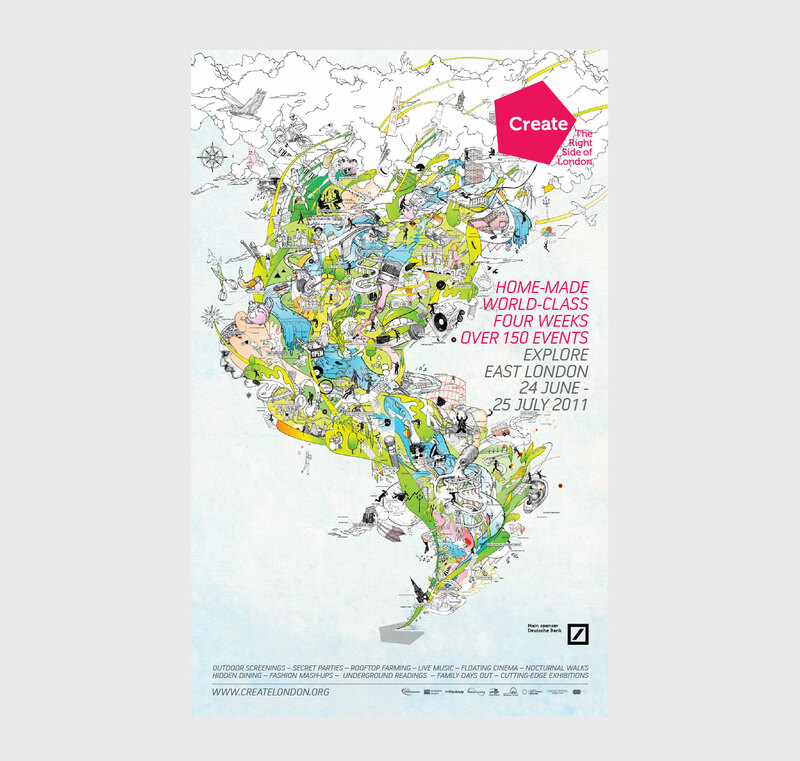 Create Festival was launched in 2010 by London 2012, the Olympic committee charged with ensuring that the Games left a lasting cultural legacy. Every summer, over six weeks, the festival presented 200+ diverse cultural events across the five Olympic host boroughs of east London, from experimental theatre to underwater concerts to architectural walks. 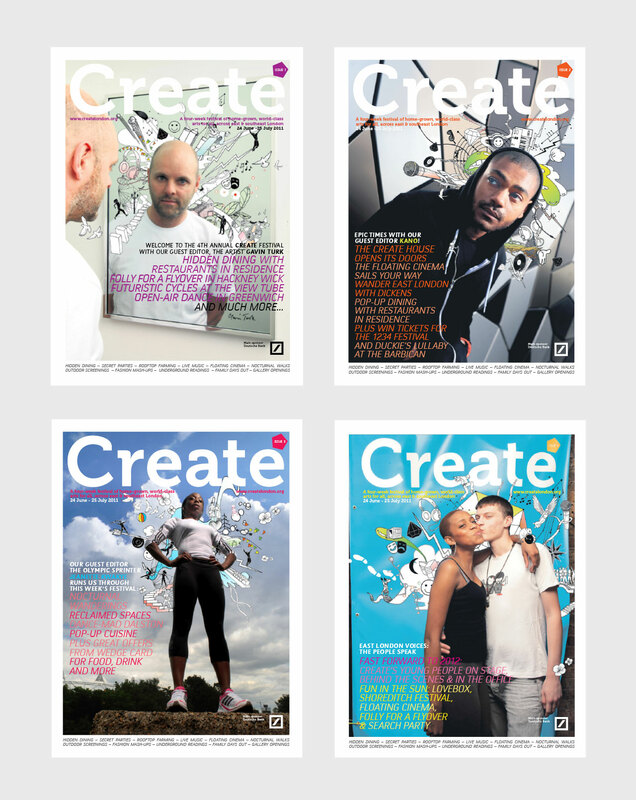 As the festival’s creative agency – a role we held for all three years of its existence – we were tasked with giving this huge range of events a strong, cohesive identity, and with marketing these activities not only to culturally engaged Londoners but also to under-engaged communities in some of Europe’s most deprived neighbourhoods. We commissioned an intricately detailed, sweetly nostalgic illustration which incorporated local landmarks, personalities and festival activities, to show the huge breadth and diversity of that year’s events. Every year the campaign included large-scale billboards, Tube and bus shelter adverts, print ads and online banner ads. We also produced a range of print materials, including booklets and fliers for specific events and venues, and a weekly 24- to 48-page tabloid newspaper for the duration of each festival. Newspapers, booklets and fliers were handed out by street teams and placed in local galleries, coffee shops, libraries, community centres, doctor’s surgeries and laundrettes, to reach Londoners of all backgrounds. We designed and built a festival website which hosted 200+ event listings per year, all linked to a custom-built calendar and map, as well as features, photo and video documentation of festival events which we commissioned and edited. Every spring, it was our job to collate, fact-check, edit and categorise all 200+ events, then begin to organise them for the website using a series of filters we had developed, to ensure visitors weren’t overwhelmed by choice. Our filters covered not only date and location (each event was linked to our custom calendar and mapped by postcode onto our custom interactive map of east London), but also by its art form, event type, price, whether it was family-friendly, and more, to make it simple and rewarding for visitors to find events and plan their schedules. We updated the site daily throughout each festival season with photos, videos and articles, and we refreshed the site design and refined the search, filter and display functions every year. We created one newspaper per week over during the festival period. They were then distributed across east London weekly containing the latest listing of events and features and coverage of the festival. We were in charge of commissioning the photography and controlling the production budgets and press passing. 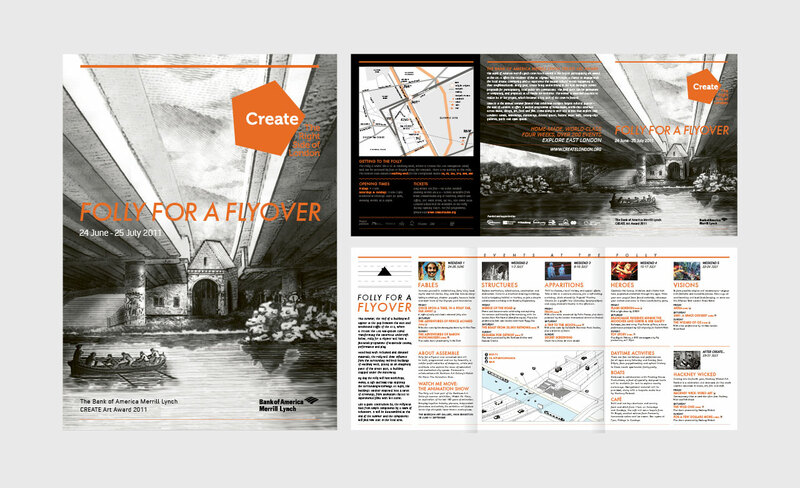 Above: Create newspaper covers. Below: selected spreads form the 4 issues. At the beginning of year one, we developed a logo based on a pentagram, a five-pointed shape representing the five host boroughs. We added a tagline – “The Right Side of London” – which was right-aligned next to the logo, a playful reference to the host boroughs’ location in east London and to local pride. We chose a typeface family which to us represented clarity, informality and inclusion, and which offered great readability at all sizes and weights. Every year, we created and executed a three-month advertising campaign. 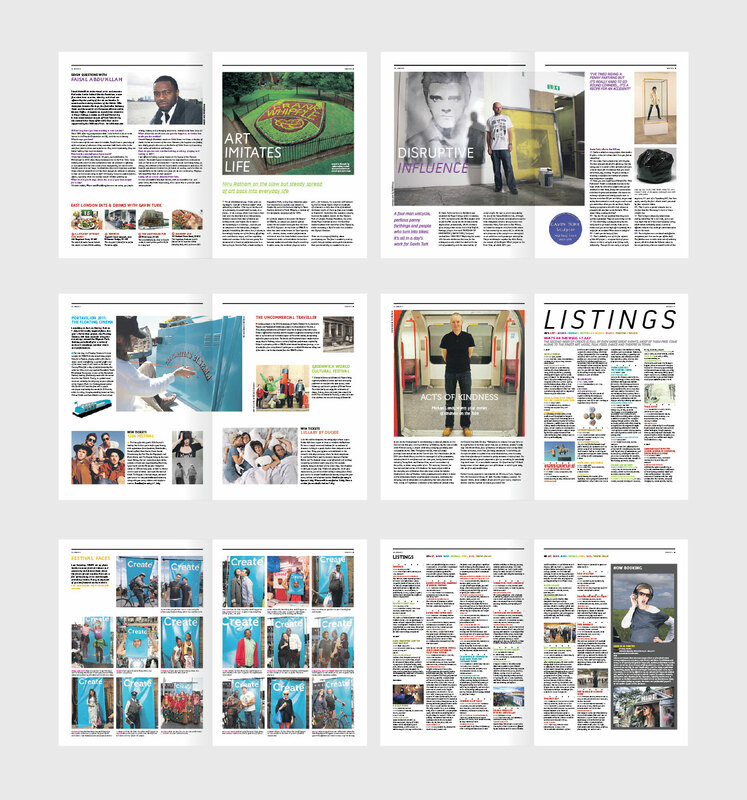 For year one, we researched, uncovered and shared the stories of five “Local Heroes”, then photographed them in iconic locations in their home boroughs – from the Olympic sprinter Jeanette Kwakye to the R&B singer Kele Le Roc to the local gardener and volunteer educator Bekele. For year two, we commissioned an intricately detailed, sweetly nostalgic illustration which incorporated local landmarks, personalities and festival activities, to show the huge breadth and diversity of that year’s events. For year three, we created a bold, playful, text-based graphic which wove together the words “Design”, “Theatre”, “Music” and “Art” with a call to “Explore East London” and the festival logo. Every spring, it was our job to collate, fact-check, edit and categorise all 200+ events, then begin to organise them for the website using a series of filters we had developed, to ensure visitors weren’t overwhelmed by choice. Our filters covered not only date and location (each event was linked to our custom calendar and mapped by postcode onto our custom interactive map of east London), but also by its art form, event type, price, whether it was family-friendly, and more, to make it simple and rewarding for visitors to find events and plan their schedules. Wai – include analytics – how many people used the site?